Able Distributors is proud to be adding four different lines of gas/electric packaged rooftop units from Nortek’s Mammoth brand to our catalog. With sizes ranging from 2 tons of cooling & 72,000 BTU of heating all the way up to 15 tons & 315,000 BTU, there is a Mammoth option for nearly any residential or light commercial application. If your client has a large home or small business, the RG6P line of gas/electric packaged units is a great choice. These units are available with cooling/heating capacities of 6 tons/166,000 BTU, 7.5 tons/200,000 BTU, and 10 tons/235,000 BTU. 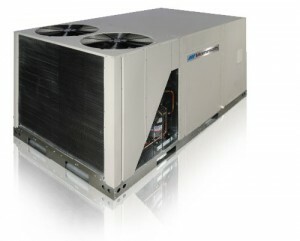 These units all provide cooling operations at an 11.2 EER rating and heating operations with an 80% thermal efficiency rating. If you need more power for a larger application, a Mammoth R6GN gas/electric packaged rooftop unit is an excellent option. Available in sizes of 12.5 tons cooling/279,000 BTU heating and 15 tons cooling/315,000 BTU heating, this product line is perfect installation in large commercial and industrial spaces. All of the additional power has a minimal impact on efficiency; these units clock in with an EER value of 10.8 and an 80% thermal efficiency rating. Both the R6GP and R6GN product lines share a number of features that improve performance, ease-of-installation, and durability. Each unit employs a two-stage gas valve to provide consistent comfort through changing heating demands. The R6GP and R6GN lines are designed with a footprint that fits all standard rooftop applications. Baserails are present to improve handling and expedite installation. Servicing these Mammoth rooftop units is simple thanks to a pair of hi/low service ports and quick-release filter access panels. Finally, protecting each unit is a resilient, corrosion-resistant cabinet. 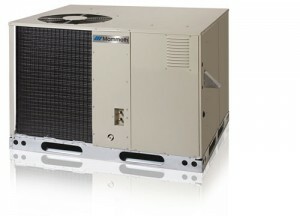 For smaller applications, Mammoth’s R6GD offers 13 SEER cooling and 80% AFUE heating in 3, 4, and 5 ton models. The 3 ton model offers 96,000 BTU of heating, while the larger two models are 120,000 BTU. As with the R6GN and R6GP lines, Mammoth designed the R6GD for easy installation and servicing. This unit also features a rustproof wire guard to protect the coil and 950-hour salt spray protection. 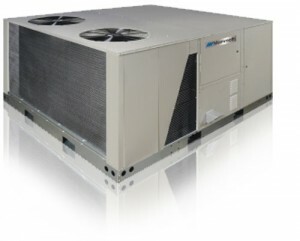 Finally, for residential and light commercial rooftop projects where energy-efficiency is a major selling point, the R8GE line from Mammoth offers 14 SEER cooling and 81% AFUE heating. Two and 2.5 ton models provide 72,000 of heating, 3 and 3.5 ton models offer 96,000 BTUs of heating, and 4 and 5 ton R8GE units offer 120,000 BTU of heating. The R8GE lineup shares a similar design as the R6GD, offering all of the same upgrades to the units’ accessibility and durability. In addition to these benefits, the R8GE also enjoys optimized performance courtesy of a Copeland scroll compressor and a pair of all aluminum micro-channel coils. When you’re looking for packaged heating and cooling solutions, Mammoth is the way to go. Their units offer an easy installation process, simple servicing, and good energy efficiency. Whether you need a 2 ton unit for a small space or a 15-ton unit to take care of some serious square footage, there is a Mammoth packaged unit for your application.